My dad took up cycling more seriously after a knee injury skiing. Some of my earliest memories are of my dad setting off on a 50 mile ride, bright spandex and all. He of course tried to get us on bikes as soon as possible. 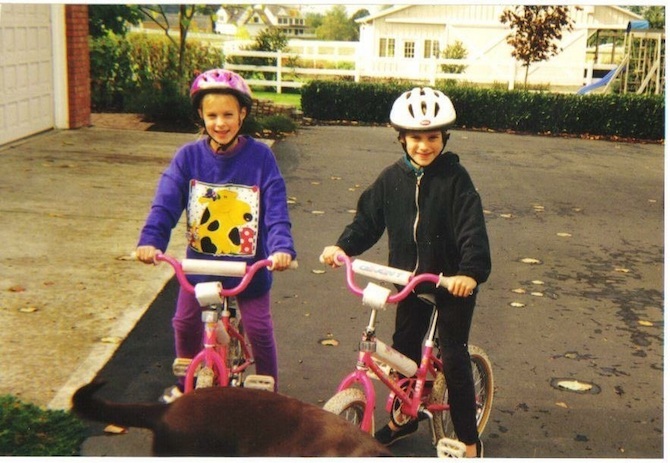 I remember my first bike vividly: matching hot pink frames with streamers on the handlebars and back-pedal brakes. When my dad took the training wheels off, my sister pedaled a couple feet and dramatically fell in the driveway, claiming it was impossible. Oh the joys of parenthood. We did finally master two wheels, and every family vacation after seemed to involve cycling. It was a form of entertainment and exercise: biking around campgrounds, through national parks, and small town bike paths. Nowadays biking is one of my main forms of transportation. I use my bike for commuting, exercise and enjoying the city on sunny days. I love the freedom out affords me. My dad still bikes today and I often go for a ride with him when I visit home. I now keep up a lot better than I used to, though I know he's still going slow just for me.